My love affair with fish started when we moved to this small township on the banks of the river Ganga sometimes in between my tween & teen years. A small quiet town, far from the trappings of the city, still untouched by the glamorous modern world, peaceful and serene it was. Life was slow, mornings were not merely a time to just gulp coffee and rush, people had enough time in their hands to stop by for a quick chat on their morning market routine. Grocery was not just relegated to weekends, fresh veggies and fish were brought home every morning from the haat or local market, a place whose sole purpose was not just to sell but also build a community. A little later in the day when the sun was high and the day had fallen into its pace to be broken only by the calls of the ghughoo (a kind of bird) in the mango tree, the odd fisherman with gleaming silver in his basket would do the rounds to sell his remaining catch. My Ma if not satisfied with the morning haul would call him over and haggle over the tangra, mourala or whatever he had on the front verandah. After much amiable chit-chat both woud be happy and the househelp would be called to settle down with the “boti” and fish in the back yard. So most days, there would be at least two kinds of fish being cooked for lunch or dinner. During the rainy season, when the river ran high, the house help’s little boy who would spend most evenings at our home under my Ma’s tutelage, would spend his afternoons at the river catching fish with his gamcha (a thin cotton towel) instead of breaking head over his fractions or algebra. His extra catch, mostly shrimp aka kucho chingri or small fish like khoira, punti would find home in Ma’s kitchen. They would be fried crisp and had with dal or a spicy dry dish made of them. Eating so many varieties of fresh fish in all sorts of jhol, jhaal , charchari and what not every day, I fell in love with fish. I also fell in love with the small town which we had to leave eventually but my love for such small towns remain and I never feel at home in a big city. The macher charchari is originally done with fish like tangra (smaller variety), mourala or other such small fish which are eaten whole with their head and tail on. When I can’t make myself to eat baked cat fish fillet any more, I fry the fillet and make a similar charchari with it. Tastes nowhere near but you got to compromise. On the rare occasions that I get good tangra from the Bangladeshi fish seller, I have a feast. Cat Fish Fillet ~ I had about ½ lb. You can use fish like smaller variety of tangra, mourala etc. If you get cat fish nuggets you can use that instead of the fillet too. 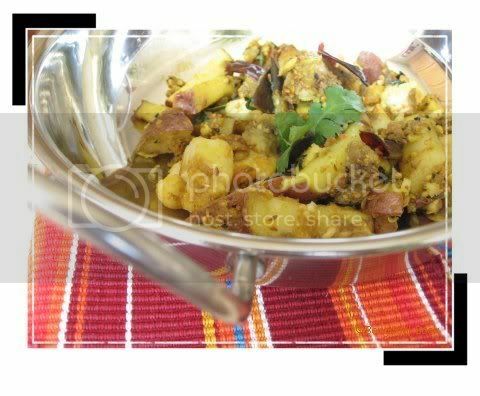 Fry the potato pieces with a little turmeric till they are a light golden yellow in color. Remove and keep aside. 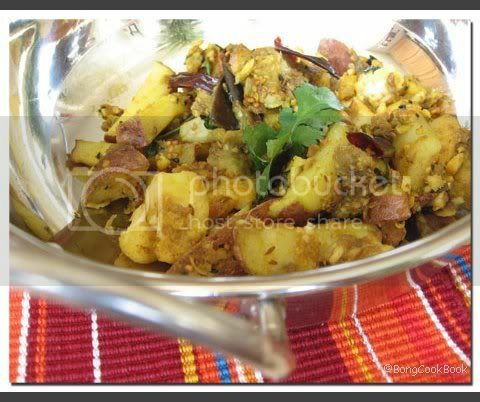 Add the cubed eggplants, add about ¼ tsp of turmeric and fry the eggplant. When the eggplant turns a little soft add the potatoes. Saute with a little sprinkle of water. Add salt, grated ginger and mix well. If you want extra hot add red chilli powder according to taste. Add about 1/4 tsp of dry roasted Cumin Powder. This is optional but lends a good taste.You may need to add very little water at this point. Cover and cook with intermittent stirring till the veggies are cooked. The eggplant will be very soft, tending towards mushy and the potatoes cooked by now. Lovely dish!!! and haven't heard of this till now!! iche korche ek thala bhaat eita diye mekhe khai...fish amar favourite..kintu A+ khaye a...A junior ekhon khete shuru koreche...so am cooking more now. The comment I wanted to make was...this tyoe of chochori also tastes good with canned fish..mackerel or tuna. I can really make out what kind of small fish u r talking about. I grew up too with only fish. This fish dish sounds perfect and delicious with any dhal or rasam. Wonderf entry 4 ur event. Lovely post - nadi ta dekhlam , chhotto chheley takey o dekhlam aar tomaar machher chhochhorir galpo tey jibey jol ashchhey , Saturday tey chingrir chhochhori banabo aar post korbo. The God of food and all things delicious bless you, girl! machher chorchari... got to try with with catfish sitting in my freezer. Will be a pleasant change from my regular jhols. I so wish you lived next door and I could show up at your doorstep every other day to try all the goodies you make! So do you eat whole small fish too ? Aaah...You have drawn such a lovely picture. Love the small towns. Hope both Li'l S and you are doing much better. I think it has been going across US...I was down too. But your posts perked me up. Although I am a bengali, I haven't been much of a fish eater. But i do love Kalia. And the doi maach you made is still in my todo list. Hmm...maybe I'll make tonight. As Saswati said, we Odiyas also call it chadchadi :) Trying it with catfish is so innovative. My love with fish started a long long time back , may be with my first rice ceremony. Shifting to Bangalore , I have no access to fish these days , even forgot the last time I cooked something fishy. Read your blog , it was great, reminded of my mom, she is a great cook. Do write some more on fishes, atleast I cant taste but can recollect those nostalgic lazy afternoons sitting and having fish next to my mom. We thought you might be interested in creating a video cooking show online especially since your blog is so popular to foodies all over the web! It's easy to do and absolutely free with an account at www.intellipodcast.com. Simply take a video of you demonstrating cooking a recipe and upload it to your computer. Sign up for a free account at intellipodcast and upload your video using the Video tab from the Member account area. You can even use the Embed tags to post the video to your own blog and other websites as well. You can also create an iTunes show and expose your own cooking show to over 60 million iTunes users. Video content will increase visitors to your blog and help increase your monthly Google AdSense revenue. So take the next step in your success as a great cooking all star online! We hope you'll check it out and use our site! We'd love to see your cooking demonstrations all over the web! Thanks and see you in video soon! Have a fabulous and creative day! I still remember trying hard to catch fish using 'gamcha' with cousins during our visit to granny's village.In our household the only vegetable we mix with fish is mango only.So this is new and different to me.Will try soon. Sandeepa, tumi kemon aacho ? Aami kaal tomar recipe dekhe maacher kalia banalam...fatafati holo! Er aage eto bhalo konodin hoini. Funny thing is that I substituted the tomato with a little bit of marinara sauce because I ran out of tomato and it worked! Tomar RCI roundup-er jonno opekkha korbo. 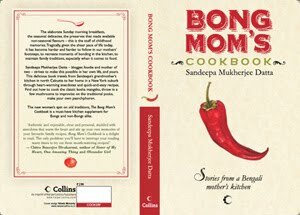 Sandeepa, glad you loved it. Usually gujarati dals do have curry leaves in it. If you are out of it, then probably you can get by without adding them. But when i make it, the flavor of the curry leaves does not overpower the taste of the dal - its just for added flavor- the taste of the cumin-coriander powder, ginger, the fenugreek seeds and the JAGGERY is what gives the gujarati dal its real taste. charchari... sandeepa it paints so many pictures in my mind... all to do with bari aar khabar! And of course family :) great entry. Made me nostalgic. I realized I haven't had this dish since childhood days! have wandered onto your post and loved the recipes. Do you have a post on mishti? 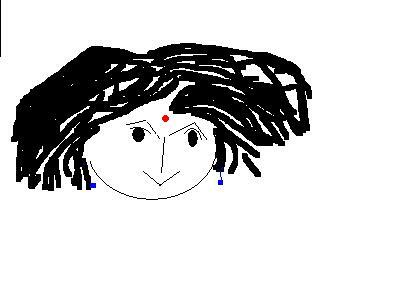 Hi, Sandeepa, I love your recipes...do you have any post on paneer?